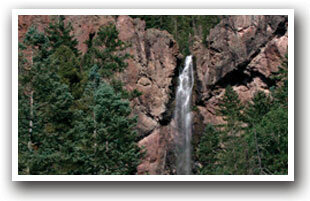 Pagosa Springs was named by the Utes who called the hot springs "Pagosah," or "healing waters." This little town, surrounded on three sides by the San Juan National Forest, is a good place to get away from it all. Explore the mystery of the only mountain home of the Anasazi at nearby Chimney Rock Ruins where these ancient farmers lived some 1,000 years ago. The twin pinnacles were once a scared shrine to the "Ancient Ones". Later, the unusual formations were a landmark for prospectors, missionaries and conquistadors who settled this rugged country. While clambering among the ruins, keep an eye out for the endangered peregrine falcon which nests here. Enjoy the town's hot springs, considered to be the hottest in the world. Windsurf, water-ski and sail on Navajo Lake, which extends southward 35 miles into New Mexico. The Weminuche and South San Juan wilderness areas' untouched beauty are only accessible on foot or horseback. The nearby Echo Lake Park and Williams Lake are stocked with rainbow and cutthroat trout, large-mouth bass and yellow perch. Other nearby places to go include hiking to Treasure Falls, prospecting on Treasure Mountain, fishing in Williams Creek and visiting the local museums. 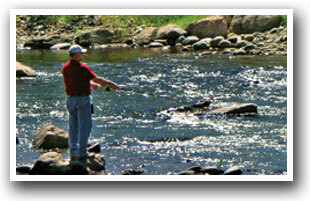 Good fly-fishing in the areas mountain streams. Nearby Wolf Creek Ski Area gets "The most snow in Colorado." Let the land of healing waters soothe you and the breath-taking wilderness inspire you. Durango and Mesa Verde National Park are great day trips with a drive time of an hour and a half.